When you think about, it’s pretty strange that while we just assume the right way to divide up inside space is by room (and room usage) more often than not, we don’t look at our outdoor space that way. The concept of “separate rooms” in a house makes us comfortable since we can make each room unique and beautiful and give that area over to a very specific part of family living such as: eating in the kitchen, working in the home office, relaxing in the family room, sleeping in the bedroom, etc. etc. And, so it goes with your outdoor space. Nothing is more depressing than a big, open space with no discernable plan for its usage. Which is why creating separate outdoor spaces (outdoor “rooms,” as it were) makes so much sense. Having individual areas operating within a larger spatial plan allows you to create areas with a very specific identity, while still maintaining a unified look. 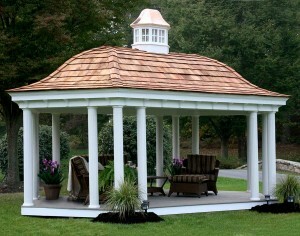 Outdoor Space: Creating A Structure. The easiest way to approach designing outdoor space is to think of it in terms of the same kind of structural elements which divide up the space inside your home. Floors, walls and ceilings are the building blocks of your outdoor space just as they perform that function indoors. Outdoor “Floors” can be grass, ground cover such as sedum or pachysandra or materials like wood or stone as used in a deck or patio. Outdoor “Walls” are most often fences, screens, hedges or can even be raised garden beds. And, outdoor “Ceilings” can be pergolas, ramadas, arbors, tree canopies, canvas canopies or awnings. Outdoor Space: What Will Be Its Function? There are so many things to do outdoors and before getting down to designing your space you need to determine what you and your family like to do in the backyard. Do you like cooking and entertaining? Swimming? Playing contact spots? Gardening? Meditating? 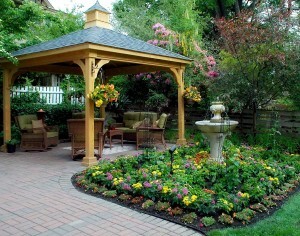 While you may be able to create several of these areas in your backyard, you will probably need to designate some priorities so that you can decide which outdoor activities are the most important to you, allocating your space accordingly. Outdoor Space: Pool Areas. Even small pools need a great deal of room so, if you decide a swimming pool is a priority for your family, you will be making a major space commitment for that particular outdoor “room.” You will need to think in terms of creating space, not only for the pool itself, but also for comfortable seating areas around the pool, areas around the pool, as well as a pool house or cabana for dressing and storage. For safety’s sake (and to also satisfy local ordinances) you will no doubt need some kind of fencing around the pool area which is also desirable for your own privacy considerations. “Floors” in pool areas must be slip-resistant and, if you want pool-side tables and chairs, consider getting a “ceiling,” too, that is, a large umbrella to keep the sun off when swim time is done. Outdoor Space: Eating & Cooking Areas. Most families love to live outdoors once the weather breaks and want to continue being in their outdoor room, long into the fall. Start your outdoor kitchen design by making a list of must-have items. These may include things like: a grill, a sink, a refrigerator, a cooktop, island and bar. You’ll also want to think about dining space and some “lounging space” as well so well-designed, weather-proof furniture is a must! This will probably be the focal point of your outdoor space, where you do most of your dining and entertaining, so make sure it is spacious and well-designed. A roof or “ceiling” for your outdoor room (like a ramada) is always a good idea since it protects you from rain and hot sun so that you can use your outdoor kitchen/dining room no matter what the weather. Outdoor Space: The Garden. If you are a gardener, designating some serious space to your love of trees, plants and flowers, is a must. You can create “gardens within gardens” if you have enough space — a rose garden in one area, a perennial garden in another, an herb garden in another — and gardens also allow (and even encourage) architectural elements like arbors, fences, fountains, bridges and benches. And, don’t forget some seating areas within the garden for both you and your guests. 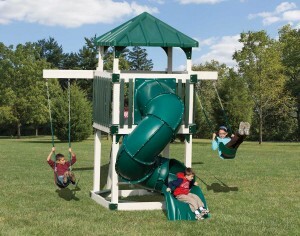 Outdoor Space: Play Areas. If you have kids who enjoy baseball, football, soccer, or just plain running around, set aside a special outdoor room just for them. You can’t beat grass for these activities. While a “ceiling” isn’t necessary, walls are a must. You don’t want errant tosses rolling into the street or wiping out those flowers you just planted in another portion of the yard. A solid fence will probably best serve your needs here, something that will easily stop a ball. Hedges, though pretty and natural, are a bit less effective, since balls can get through them or get lodged within them. Outdoor Space: Extend Your Season. 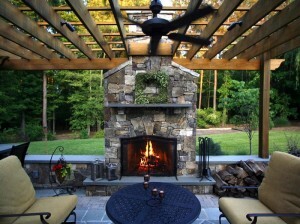 Why limit the time you spend in your outdoor spaces to the summertime? Even for Northern climes, accessories are available that can extend your enjoyment of the yard into other times of the year. Outdoor fireplaces, fire pits, electric heaters and gas heaters are accessories that will keep you warm through late fall and allow you to resume your pursuits early in the spring. Outdoor lighting is another great “extender,” permitting you to enjoy your outdoor spaces under the stars. Whatever you want to use your outdoor space for, plan it carefully and it will bring you so much fun for years and years to come! At Fifthroom.com, we can help.